This month, Metro Verdicts provides information on facial scarring settlements and verdicts in Maryland and Virginia. The median facial scarring verdicts in Maryland and Virginia are $20,000 and $32,500, respectively. These numbers seem bizarrely low. Of course, I’m not sure about the inclusion criteria for this study. How do they define facial injuries? Are they permanent? Must they be visible? Because for what I consider facial scarring, these number seem shockingly low. Remember too that these are the median verdicts and settlements. 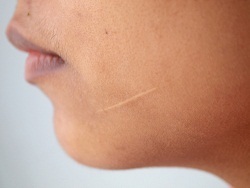 The average is invariably higher, probably at least 2 or 3 times higher for facial scars. So my usual words of caution – you can’t predict the value of your case or even the range of value of your claim by just looking at similar cases – hold particular force with the injury of a scar on your face. Still, we give you some sample verdicts and settlements because they are one weapon that you can use to try to get a better idea of what your case might be worth. 2014, North Carolina: $775,000 verdict. Plaintiff, a 20-year-old co-ed college student, suffered permanent scarring on her face, head, buttocks, arms, and legs in a car accident in Durham, North Carolina. She also suffered a broken jaw. The at-fault driver was drunk. She was hospitalized for nine days. She lost a semester of school at Carolina Central University and lost her softball scholarship. In a bench trial, the judge awarded her $775,000. State Farm paid some of the award as uninsured motorist benefits. This verdict is bizarre on a lot of levels. Two-thirds of the verdict — was punitive damages. So only $250,000 in compensation for these injuries? Ridiculous. How much of this was from the facial scar? How serious was the scar? Again, that is the problem, and I have no idea. To give you some idea of the severity of the injuries, this girl had $101,073.16 in medical bills. State Farm. 2014, California: $925,000 settlement. A 25-year-old woman is hit by a dump truck that had crossed the center line. It gets worse, believe it or not. The truck landed on top of her vehicle. She suffered a facial scar and injuries to her head, neck, and right foot. Her neck problems were serious but in this case, the scar to her face seems like a critical part of her case. The dump truck’s insurance company, Progressive, agreed to a $925,000 settlement with the victim at a mediation before trial. 2014, Texas: $106,000 settlement. An eight-year-old girl and her mother were at a relative’s house for Mother’s Day weekend festivities. Another family member brought her dogs, two Labrador mixes, and invited the child to see the dog. But the dogs had been locked up all day and were particularly agitated. One dog aptly named Bear, bit Katie. She had a laceration on her face and medical bills of $17,000. She had a scar on her face and arm. The scar on her face was a red line about the length and width of a crayon. She said a future scar revision would be about $8,500. It is unclear what the scar might look like after the surgery. She brought a lawsuit; awkwardly I’m sure, against the relative. The injury was covered under the relative’s homeowner’s policy (which few people understand usually extends coverage far beyond the home). The defense argument from Amica Insurance: the scar will go away at some point. The case settled for $106,000. 2013, North Carolina: $50,000. Another dog bite case involving an 8-year-old. The child was bitten in the face by a German Shepherd, leaving permanent scarring. The child needed 12 stitches in her face that led to some permanent scarring that resembled a dimple in her cheek after the stitches were removed. The child had scar revision surgery that helped some, but the dimple-like scar is still there. Obviously, in the word of scars on your face, a “dimple-like” scar is one of the least problematic. I have handled scores of cases that have involved these kinds of awful scars. If you want to get a free on-line consultation to get a better idea of the value of your case, fill out this brief case evaluation form and I (or another attorney here) will get back to you immediately with my thoughts on your potential claim.